Invisalign is a modern technology that works in similar circumstances to braces. Invisalign can straighten misaligned teeth. 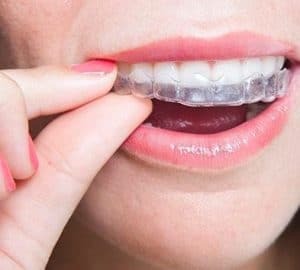 The advantage of Invisalign is that it is transparent or clear in comparison to metal braces and has little no effect on the speech of the patient. Invisalign treatment begins with the dentist taking bite impressions. These impressions are than laser scanned into a computer to produce 3D images. From these images clear individualized aligners are developed. How many visits will I need for my Invisalign? The entire Invisalign treatment may take between 6-15 months, and you will be required to visit your dentist every 2-3 months to make adjustments. An approximate cost of Invisalign at our practice is $4,500. This figure is dependent on your individual’s teeth makeup. Some patients are more suitable to Invisalign than other. Meaning the procedure or treatment maybe more or less expensive depending on the individual. Our dentists would love to speak with you and tailor a treatment plan that suits you the best. Invisalign is a modern technique to improve an array of structural tooth issues. These issues may include; crowded or widely spaced teeth, over bites and under bites, cross bites and midline shifts. Driving directions coming from Powerhouse Museum going to Sydney Dental Crowns takes around 12 minutes. Head northwest on Harris St toward William Henry St and go right to merge onto Western Distributor/A4 then use the left 2 lanes to take the exit toward City Centre/City N. Continue onto Western Distributor and in 230 metres, continue onto King St then left onto Elizabeth St. Go left onto Hunter St and finally, another left onto Pitt St where you'll reach us on the left side of the road.